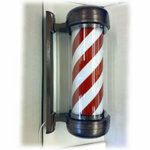 This illuminated and highly visable barbers pole is traditionally finished in hammered Antique Copper, with revolving red, white and blue stripes. Easy to install and Supplied with 4 metres of cable. Vandal resistant and fade free. This illuminated and highly visable barbers pole is traditionally finished in hammered Antique Copper, with revolving red and white stripes. Easy to install and Supplied with 4 metres of cable. Vandal resistant and fade free. 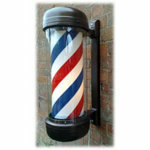 Static illuminated Barbers Pole with Red & white Stripes. Easy to install with simple bulb replacement and supplied with 3 metres of cable. Vandal resistant and fade free. 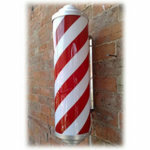 Static non-illuminated Barbers Pole with Red & white Stripes. Vandal resistant and fade free. 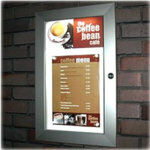 With lockable doors and header area that can be personalised with your full colour logo. Made from durable aluminium frame and bright long lasting LED lighting, supplied with 2 keys, vandal and weather resistant. Illuminated Acrylic Message Board with top metal light bar. Large 59 x 49cm Writing Area. 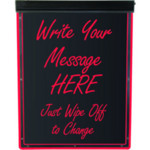 Write your our personal message with the fluorescent pen supplied, simply wipe off with duster and write a new message. The board edges and your message are both illuminated with a choice of 7 different colours red, purple, green, yellow, lilac, pink, blue or you can set to auto cycle through each colour. 12 month guarantee. Comes with 240Volt To 12Volt adapter, hanging chain, 2 fluroescent pens and wipe off duster. Direct Salon Supplies portable moving message machine. Effective moving message machine designed for both portable and static use. The product features 7 x 50 dots resolution. Easy use and installation. Program your own message from the remote using characters numbers and symbols. Fast and slow scroll modes, built-in words and phrase library, last message button replay. Direct Salon Supplies Small Static Open Red/Blue eye catching, bright and stylish LED open sign. Durable lightweight construction, 3 metre cable with 3 pin plug and hanging chain supplied. Static, flash and chase functions. With 60,000 hours lamp life. 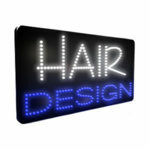 Direct Salon Supplies Large Static Open Red/Blue eye catching, bright and stylish LED open sign. 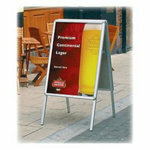 Durable lightweight construction, 3 metre cable with 3 pin plug and hanging chain supplied. Static, flash and chase functions. With 60,000 hours lamp life. 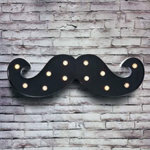 a great range of decorative carnival style lights in the shape of a moustache, available in 4 great colours red, black, white and rust, with bright LED bulbs for low power consumption, powered by 3 x AA Batteries (not included). Great for use within your barbers shop or window on a shelf or wall mounted. Dimensions approx Width 52cm Height 16cm, Depth 5cm. Direct Salon Supplies Pavement Poster Display, a low cost stylish way to display your special in shop offers and products. A silver anodised aluminium frame with front loading snap open and snap shut mechanism. 32mm profile snap frame with chrome corners, anti glare cover on both sides, steel back panels and hinged locking arms for weight and stability. Direct Salon Supplies LED Open Static or Flashing Sign (Outer Blue Circle Movement). Sizes: 350 x 580 x 17mm. 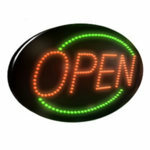 Direct Salon Supplies LED Open Moving Oval Static or Flashing Sign (Outer Green Circle Movement). Sizes: 340 x 600 x 17mm. Direct Salon Supplies LED Flashing Nails Beauty Static or Flashing Sign. Sizes: 300 x 580 x 17mm. 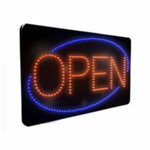 Direct Salon Supplies LED Open Small 5mm LEDs sign. Sizes: 200 x 350 x 17mm. 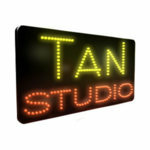 Direct Salon Supplies LED Tan Studio Static or Flashing Sign. Sizes: 300 x 580 x 17mm. Direct Salon Supplies LED Hair Design Static or Flashing Sign. Sizes: 300 x 580 x 17mm. 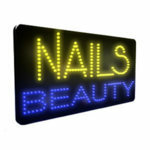 Direct Salon Supplies LED Nails Static or Flashing Sign. Sizes: 300 x 580 x 17mm.